After three years of construction, the Science and Math Complex is nearing completion with a scheduled opening date of September. Once the center of construction on campus, the building is now one of many projects either underway or near completion as students return for the fall semester. 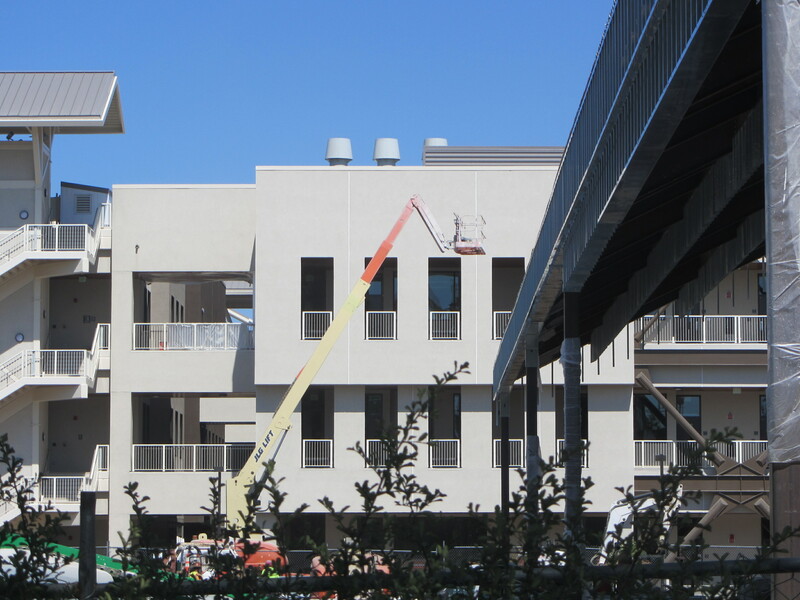 The Science and Math Complex is one of the biggest construction projects at Delta College. “The new building is awesome. The presentation systems there are state-of-the-art. I think students will be blown away when they walk in,” said Dr. Matt Wetstein, Assistant Superintendent/Vice President of Instruction. A few items need to be finished, such as fire safety checks and ensuring that elevators are in working order. As Delta College prepared for the building opening, Taisei Construction filed suit against the college for damages and delays in construction. The company believes the delays are Delta’s fault. “We think differently,” said Wetstein. With the new building nearly complete, the next hurtle will be how to move currently scheduled Cunningham classes over. “It’s a very tricky scheduling matrix that we have to work out,” Wetstein said. The future for Cunningham is demolition. “In our plans submitted to the state, are for, once we build the new building, which has a larger capacity, more space, more labs, that the college would tear down Cunningham,” Wetstein said. A student group started a petition in the spring to save the Cunningham building. Several presidents at the college have gone to the chancellor’s office attempting to save Cunningham and the adjacent planetarium. Due to the contract with the state, saving Cunningham would be seen as reneging the deal. The message from the state was, ‘if you try to do that, we would ask for money back,’” Wetstein said. No date is set for tearing down Cunningham. An abatement process will be the first step for the asbestos in the walls. The fall semester will also see more campus construction. Restrooms on campus are currently being renovated. “First of all they’re almost … getting close to 40 years old. So you’ve got broken tiles, accumulation of wear & tear, graffiti, scratching on mirrors. Over years, they’re showing their age,” Wetstein said. The metal girders in many of the restrooms have rusted, or are showing signs of water damage. Simply adding new tiles has become a larger task; mold growth and other factors have extended the restroom renovations. Until completed, a request has been made to have a trailer-like restroom facility that will be placed by Shima. “Now we only have half the bathrooms that we used to have … it’s going to be an inconvenience for the fall term, no doubt about it,” he said. The restrooms in the forums, however, will be completed sooner. The spring semester will bring more changes, particularly in the $800,000 that will be spent on new technology on a number of classrooms. “Some of the classrooms really need new equipment, replacing old presentations systems, computers, podiums, projectors,” Wetstein said. Larger classrooms with at least 55-80 seats will be first to receive the new equipment. Speech and English classrooms will get presentation systems. The money comes from savings from the 2012-13 year. “We identified some savings through vacancies, positions we didn’t hire people in, just people watching their budgets really well,” Wetstein said.